ESTA SI QUE ES UNA BUENA NOTICIA ESPERAMOS SE NOS CUMPLA EN ISTMINA. Fuente: Oscar Andrés Sánchez A. La inversión en sistema de acueductos es de 120.000 millones de pesos. En un año el acueducto de Quibdó, capital de Chocó, pasará de tener una cobertura del 33 por ciento al 90 por ciento. Este proyecto, en el que se invierten 47.000 mil millones de pesos, se empezó a ejecutar hace dos meses, y según el gobernador (e) de este departamento, Hugo Arley Tova, las obras avanzan en un 22 por ciento. Los recursos fueron aprobados en el primer paquete de regalías, en septiembre del año pasado. El departamento y el Estado aportaron cada uno 17.000 millones de pesos y el municipio de Quibdó, 13.000 millones. “El Gobierno puso de nuevo en la agenda al Chocó, porque recuperaron la confianza en nuestras instituciones. Hemos continuado los proyectos que dejó el gobernador Luis Gilberto Murillo”, sostuvo el mandatario regional. En las demás cabeceras municipales también hay proyectos de construcción de acueductos y alcantarillados, algunos ya en marcha y otros en proceso de licitación, que hacen parte del Plan Departamental de Aguas. Según Tovar, sin sumar Quibdó, hay una apropiación de 63.00 mil millones para planes maestros y para la construcción de rellenos sanitarios, como complemento al saneamiento básico. “Tenemos una estrategia agresiva para darle cobertura en un ciento por ciento de agua potable a las áreas urbanas de los municipios”. El gobernador agregó que, después de 50 años de espera, Juradó tendrá acueducto antes de culminar este año, gracias a una inversión de 4.834 millones de pesos. De igual manera, en Atrato se invertirán 9.150 millones, en Bahía Solano, 7.836 millones; en San Pablo, 5.785; en Itsmina, 9.143; en Baudó, 1.607 millones; en San Juan, 3.625; en Nóbita, 4.320; en el turístico Nuquí, 4.602; en Rio Quito, 2.880; en San José, 1.077; en Tadó 16.000 y en Unión Panaramericana 4.400 millones. En Alto Baudó invertirán 837 millones; en Medio Atrato, 622 millones; y en Lloró, 6.831 millones para el Plan Maestro. Por otro lado, en Bagadó se construirá un relleno sanitario por 902 millones, al igual que en el Carmen de Atrato, donde se invertirán 961 millones. Para evitar tragedias como la ocurrida en julio pasado en el resguardo Quitaradó (Riosucio), donde tres niños murieron y 64 más resultaron intoxicados por beber agua contaminada, el departamento avanzan en el estudio de un proyecto para construir, vía regalías, sistemas eficientes de acueducto y alcantarillado en 90 comunidades, de las cuales 60 son indígenas. energía mareomotrix en el Pacífico. anteriores de 1964 y 1984 caducaron. Por favor haga click en el enlace para ver el video. Investigador Centro Internacional de Física (CIF), Bogotá, Colombia. Profesor retirado en septiembre 2008 del Depto Física, U Nacional de Colombia, sede Bogota) por proveer estos artículos. Agreements were struck between the governments of the United States and Panama, and the United States and Colombia, according to which the U.S. committed to financing two- thirds of the total cost of the construction of the remaining span of the Pan-American Highway, in the Darién zone. Al- though that U.S. law remains in effect, in October 1975, the Federal District Court for the District of Columbia prohibited allocation of funds for the construction of the Pan-American Highway in the Darién, as part of the legal case brought by the Sierra Club and other ecologist groups which questioned the environmental impact studies that had endorsed the decision to begin construction of the Darién highway. In 1996, after international bidding, Colombia’s National Institute of Roads (INVIAS) contracted new environmental studies, this time with a consortium made up of Ecology and Environment, Inc. and Hidromecánicas Ltda. 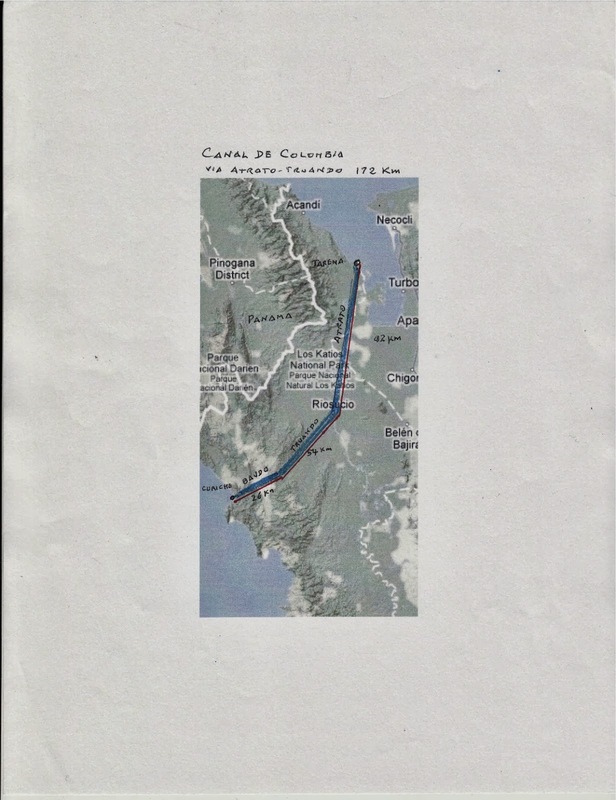 And despite the fact that the National Congress of Engineering of Colombia, held Aug. 14-16, 2004, determined that this project should be given priority, to this date there has been no construction on the Darién Highway, either on the Colombian side or the Panama- nian side. It must be noted that President Alvaro Uribe has in- sisted, to no avail, that the successive Presidents of Panama, Mireya Moscoso and more recently Martín Torrijos, promote the construction of the final span of the highway. But, on the Panamanian side, there has been no political will to carry out the project. In truth, both in Colombia and in Panama, the ministries of the environment have vetoed the highway’s construction. In sum, as LaRouche and his associates have documented, environmentalist is fascism, created by the British Crown to return humanity to the Dark Ages. And this must be stated clearly. hampered by extreme concerns about protection of the envi- ronment. As pointed out by him, extreme environmentalism may condemn some regions of the world, like my country, Colombia, to stay in their current state of lesser economic de- velopment, while the more advanced countries reap the ben- efits of development previously attained at a lower cost, when the environment was not given the paramount importance of nowadays. This is clearly inequitable. Also of great interest to us is a related theme of La- Rouche’s: the transfer of technological knowledge. A tool to- wards this end may be the peaceful use of nuclear technology. The latter idea was already envisioned by another statesman, the former U.S. President Eisenhower, with his program of Atoms for Peace in the early 1960s. But the development of nuclear-powered electricity was almost completely stopped by the environmentalist movement in the United States in the mid-1970s. On a global scale, today we are close to a rebirth of nuclear power using inherently safe, modular, small nucle- ar plants that could also be used in developing countries. The LaRouchian movement has also advocated the massive use of nuclear power as a means to build infrastructure, as in the Eur- asian Land-Bridge. It is a privilege and a pleasure to join the Festschrift hon- oring the very original thinker Lyndon LaRouche on his 85th birthday. This short note is related to the completion of the Pan-American Highway, a project that is a natural comple- ment to the Eurasian Land-Bridge. In a separate, forthcoming note we will advance some ideas for the revival of nuclear technology in Colombia. By the mid-21st Century, will it be possible to go easily by land from the Cape of Finisterre in Portugal to Ushuaia in Ar- gentina? Three key elements are missing today: the Eurasian land-bridge, the tunnel across the Bering Strait, and the Inter- American Land-Bridge. The first two aspects have received ample consideration within the LaRouchian movement, so that this note concentrates on the third element, from the broader context of social and economic development of the isolated Atrato River region in Colombia. A forthcoming note will address the various roles of nu- clear technology for peaceful use in a developing country: (i) a means for transfer of technological knowledge; (ii) a tech- nological tool in medicine, agriculture, engineering, environ- ment; and (iii) a builder of infrastructure for social and eco- nomic development, such as electricity, water, and process heat. For the time being, the present note mentions some past proposals for the use of nuclear explosives for the excavation of an inter-oceanic canal in the Atrato region. the river serves as a border between the Colombian Depart- ments of Chocó and Antioquia. The Atrato region, one of the rainiest on Earth, is covered by a jungle with an extremely high biological diversity. The population is sparse, mostly Afro-Colombian (over 90%), with some indigenous groups like the Noanamaes, Katíos-Emberas, and Kunas (the latter were forced to move to Panama by tribal fighting). Due to its strategic geographical position, three groups of large engi- neering projects have been considered for this region: a land- bridge to connect Central and South America; a waterway be- tween the Atlantic and Pacific oceans; and large hydro-electrical power plants taking advantage of the perma- nent very high water discharges of both the Atrato and San Juan rivers. In some proposals, the hydropower projects could be part of an inter-oceanic canal project. Since the mid-1970s, these hydro projects have been incorporated into the invento- ry of potential electrical sources in Colombia, and no further mention of them will be made here. In the year 1500, during Columbus’s fourth trip, the Span- iard Rodrigo de Bastidas arrived at the Gulf of Urabá. San Se- bastián de Urabá was the first Spanish settlement in South America, founded in 1509 on the eastern shore of the Gulf of Urabá by Alonso de Ojeda; it did not survive, due to pressure from local indigenous people. A year later, Santa María La Antigua del Darién was founded on the western side of the same Gulf, and it served as a base for the initial exploration of the adjacent territories, which today are part of Panama and Colombia. It is an irony of history that the region of the Atrato River, the first part of South America explored by Europeans 500 years ago, remains as one of the less developed areas in Colombia at the beginning of the 21st Century. Vasco Nuñez de Balboa departed from Santa María with an expedition that crossed the Panama Isthmus and reached the Pacific Ocean in 1513. With the help of indigenous guides, Balboa went by boat to Carreto Bay, or thereabouts, navigated in a piragua (a dugout canoe) upstream on one of the many rivers discharging into the Caribbean, then crossed by foot the rather low Serranía del Darién, descended following the course of a river draining into the Chucunaque River, and nav- igated by piragua downstream on the Chucunaque until reach- ing the Gulf of San Miguel on the Pacific Ocean. . . .
the Bio-Pacific study, for an alternative way to close the Darien Gap, without crossing the two national parks. It is based on a new road to the Bay of Carreto on the Caribbean coast of Panama, followed by a ferry connection to Turbo on the east coast of the Gulf of Urabá. 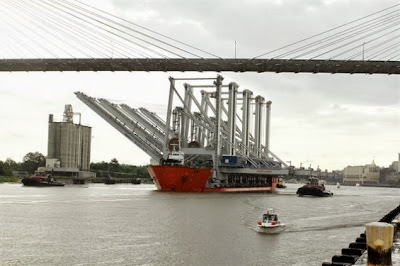 As expected for a ferry connection, this alternative will limit and slow down the road traffic along the Pan-American Highway. In the opinion of the present writer, the concerns of the environmental groups for the protection of the two National Parks are legitimate, but it is also clear that a ferry connection is not the most efficient way to complete the Pan-American Highway. Instead of the ferry connection, it is possible to build a land-bridge without entering the Darien and the Katíos National Parks. This novel alternative is called here the Bal- boa Route-2007. along the western shore of the Gulf of Urabá, until reaching the Atrato swamps at Unguía. The proposed route turns east, bridg- es the Atrato River, and joins an existing road leading to Carepa in the vicinity of Caño Carepita. Chocó, and from Caño Carepita to Carepa in a banana- producing region of the Department of Antioquia. The pro- posed route will complete and improve these roads. The proposed Balboa Route-2007 will finally complete a project envisioned more than a century ago. An operating Pan-American Highway from Alaska to Patagonia would be the natural companion to a Eurasian Land-Bridge. These routes are geologically viable for excavation with nuclear explosives. Source: E. Graves, “A New Canal,” Nuclear News (February 1965). Japanese people and some indigenous groups settled in the Atrato region since pre-Columbian times. This evidence lends some credibility to these folk tradi- tions. After Humboldt’s writings, for 50 years there was no serious consideration of the possibility of building a canal to communicate between the Atlantic and Pacific oceans using the Atrato River. In 1852, Mr. F. Kelley of New York funded an expedition to survey the Atrato River from its mouths in the Gulf of Urabá to the mouth of Quito River, near Quibdó,4 the current capital of the Department of Chocó. The Atrato River is wide, and may be easily navigated as far as Quibdó, which is at an altitude of 40 meters above sea level, and about 400 km upstream from the Gulf of Urabá, which means that the river has a very small slope of 1 meter in 10 km. and 1914. The width of the Panama Canal cannot accommo- date today’s large oil tankers and other modern vessels; addi- tionally the canal is overcrowded. As a partial solution, Pana- ma on Sept. 3, 2007 started construction of a US$5,000 million expansion of the canal, which will be ready in 2014. This ex- pansion will allow larger ships to cross, but will not solve the problem of overcrowding. The possibility of building a canal across Nicaragua has been known since the mid-16th Century; different routes, some with locks, other at sea-level, have been considered. To- day, at the beginning of the 21st Century, there is still interest, as an alternative for solving the overcrowding in Panama. Routes using the Atrato River are another alternative, as dis- cussed next [see Figure 1]. shows five routes that were identified by the former U.S. Atomic Energy Commission (USAEC) as being suitable for the use of nuclear explosives.6,7 From the point of view of iso- lation and sparse population, routes 17 and 25 in Panama and Colombia, respectively, were identified as the most promising routes for using nuclear explosives. The Sasardi-Mortí River Route 16 is relevant in the context of the present writing, be- cause it is part of the Balboa Route-2007 proposed in the pre- vious section. The fact that nuclear explosives are viable, means that the geology in the area of the Mortí River may be appropriate to build a tunnel to cross the Serranía del Darien. close the Darien Gap (recall previous section), even if built using conventional explosives only.... An exclusion zone would be required if the whole canal were excavated using nuclear explosives only (Route 23C). In an exclusion zone, all population would have to be evacuated for several years, a condition that may not be politically acceptable today. 1. C.M. Pepper, “The Pan-American Railway,” Bulletin of the American Geographical Society, Vol. 36, No. 8 (1904), pp. 466-470. 3. G. Menzies, 1421 The Year China Discovered the World (London: Bantam Press, 2006). 4. F.M. Kelley, “Explorations Through the Valley of the Atrato to the Pacific, in Search of a Route for a Ship Canal,” Journal of the Royal Geographical Society of London, Vol. 26 (1856), pp. 174-182. 5. U.S. Army Corps of Engineers, Inter-Oceanic Canal Studies-1970, Annex V—Study of Engineering Feasibility (Washington, D.C.: Atlantic Pacific Interoceanic Canal Study Commission, Dec. 1, 1970). Appendix 14, Route 23. 6. E. Graves, “A New Canal,” Nuclear News, February 1965, pp. 13-17. 7. E. Graves, “Nuclear Excavation of a Sea-Level Isth- mian Canal,” Proceedings of the Conference on Engineering with Explosives (Washington, D.C.: USAEC, 1964), pp. 321- 334. 8. J.-E. Botaggisio, “Alternatives for an Inter-Oceanic Ca- nal in Chocó” (in Spanish), talk to the Engineering Society of Antioquia (Sociedad Antioqueña de Ingenieros), Feb. 20, 2007. 9. M.M. Hecht, “How To Build 6,000 Nuclear Plants,” 21st Century Science & Technology, Spring 2005, pp. 2-3.
la Compañia CISCO y su Filial de Telepresencia WEBEX. Neoyorkino Frederick M. Kelly en 1854.
infantil cinco veces mayor que en el resto de Colombia. la construccion y avance del pais. La construccion de la obra requiere crear una empresa mixta como Ecopetrol. Pueden las mareas oceánicas producir energía? Choco en la Era Digital. "Viaje al pueblo más pobre de Colombia"